Many modern musical trends have emerged soulful singing bluesman. And to what do I owe the Blues? Why this music is associated with a special energy, freedom and the infinite sadness? the Answer to this question must be found only in the centuries, namely in the late nineteenth century, when, about 1895 music performed by African Americans, United in one General term "blue devils", just expressing her General depressive mood. However, the music is "yearning to devils" it was called a short time, almost immediately going to a well-known reduction of "blues". while the Blues you can name any sad song performed by an African American, but in the direction there were several varieties. Such a number of musical bases was caused primarily by the life story of the musicians and their ancestors. would the Blues what it is today, don't get the time African Americans into slavery in the cotton plantations of the United States? This complex question has no simple answer. But it is working in slave-owners and growing cotton, while living in conditions of complete national isolation, the ancestors of African Americans sought all possible ways to remind yourself who they are. So often echoed over the fields, singing their sad, full of longing for the lost freedom and homeland. And it was not until the abolition of slavery in 1863. After the whole nation received the long-awaited freedom on the American continent, it was necessary to look for a place in the new world. Many musicians and singers found him in the performance of their national songs in different cafes or at parties. Since that time the Blues became known and for outside public. However, until the global popularity, acceptance and universal love he was still very far away. The first recognized in the United States became a bluesman singer William handy. 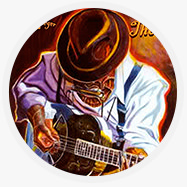 It belongs to him the glory of the Creator of the famous Blues song "The Memphis Blues". In fact, the history of the Blues started with it – it is only after the appearance of the song Blues began to allocate a separate musical direction. But from the mixture of the national anthems become the classic Blues, this musical genre had to be done the hard way of development and to cope with many difficulties. Therefore, only by the 20 th years of the last century on various music sites starting to sound classical Blues. And he immediately are faithful followers in the face of Mamie and Bessie Smith, and MA Rainey. They did a lot for the genre, because thanks to them he became known far beyond the Atlantic ocean. Well, what with the Blues today? Today, this genre continues to grow, but again became a music for music lovers. However, the Blues formed the basis of jazz, which means that in many modern musical popular destinations.